Almost £200,000 has been shelled out by cash-strapped County Hall chiefs in compensation for pothole damage to vehicles in the last three years. Hundreds of drivers across Lancashire made claims against the council for damage caused to their vehicles on the county’s roads since 2012. But the number of successful claims has more than halved since last year, with highway bosses citing a new system for dealing with potholes among the improvements. They are quite a hazard for bikers, they are very dangerous and you are constantly looking out for them and it’s taking your mind off the traffic. Lancashire ranks 19th in the list of local authorities, based on the number of claims made in 2014/15. But Lancashire is the 12th largest highway authority out of 207, and has about 4,300 miles of road to maintain. Despite a falling number of claims, potholes still prove a menace for road users, especially cyclists and bikers. Lorraine Elliott, known as Zebedee among members of the Millennium 2000 BC bike club, said potholes were dangerous for bikers. Lorraine, 52, who has back problems and rides a specially-built trike, said she hadn’t noticed a change in the state of the roads. She said: “Because I’ve got a trike, and it’s a car engine trike, it’s a lot wider than a motorbike. Because I have a middle wheel, it’s very difficult to avoid potholes in the middle of the lane and sometimes I’ve got to go straight through them. But, because I have a back problem, every time I go through a pothole it bangs and it damages my back. It’s annoying I can’t avoid them because I would have to go into oncoming traffic. They are really bad, especially when it’s raining, because you don’t know how deep they are. I know bikers who have come off at a pothole, because the hole was deeper than they thought. According to figures, released by the RAC Foundation, following Freedom of Information requests to authorities across the country, 378 claims were made against Lancashire County Council in 2014/15, with 101 being successful. The value of the claims was £35,958. The value of 240 successful claims in 2013/14 was £61,950, while the value of 272 successful claims in 2012/13 was £88,322. While Lancashire County Council bosses have shelled out thousands, neighbouring councils Blackburn with Darwen and Blackpool paid just £744 and £1,089 last year. County Coun John Fillis, cabinet member for highways and transport, said: “Our highest priority is the safety of people using Lancashire’s roads. We’ve significantly reduced the amount paid out in legal claims as a result of damage to vehicles. “Over the past few years, we’ve seen year-on-year reductions in the number of claims being made against the council, and the number of successful claims has reduced by 50 per cent in just two years. “We introduced a new system in 2013 for dealing with problems on our roads, which fixes potholes more effectively and efficiently. Although we’re ranked 19th in this list, we’re the 12th largest highways authority out of the 207 in England, Scotland and Wales. We have a rigorous system to inspect the roads, pick up on any faults and carry out repairs. We’re doing everything we can to keep roads in a safe condition.” An LCC spokesman said the new system cut paperwork, and allowed more time to fix roads. He said: “We brought together different systems in 2013 for dealing with potholes to make them more effective and efficient. “This includes logging potholes by area, rather than individually, so teams can fix several potholes while in a particular part of the county. 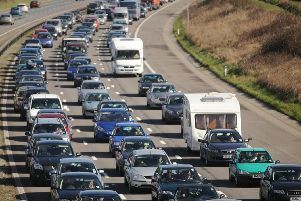 Steve Gooding, director of the RAC Foundation, said: “Ahead of the general election an RAC Foundation poll found that the condition of roads and pavements was regarded as the number one transport issue amongst voters.